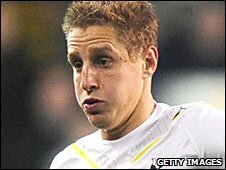 Defender Michael Dawson has committed his future to Tottenham by signing a contract that is set to keep him at White Hart Lane until 2015. The 26-year-old, who moved to White Hart Lane from Nottingham Forest in the 2005 January transfer window, has made 184 appearances for Spurs. Dawson has impressed at centre back this season, helping to keep clean sheets in seven of the last nine games. "I have loved it since I first signed, so this was an easy decision," he said. "I am delighted the club wants me to stay for another five-and-a-half years. With Jonathan Woodgate injured and Ledley King unable to play games in quick succession, Dawson has been a regular this season, often partnering Sebastien Bassong at the heart of the defence. And his form has led Spurs boss Harry Redknapp to tip him for an England call-up.